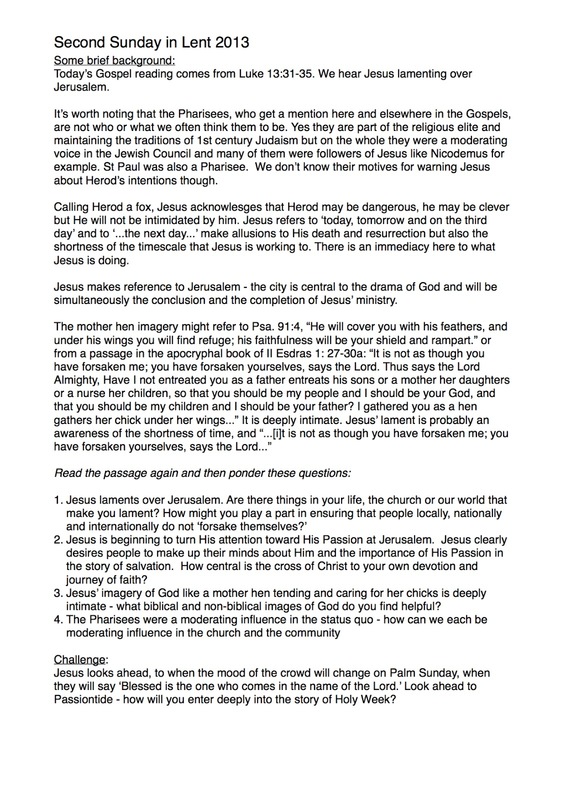 Below are some brief Bible study notes to accompany today's Gospel reading from Luke 13:31-35. Enlarge them by clicking below or you can download them from the downloads section of this site. Listen. What can you hear? If we sat here long enough we would perhaps hear the draw of our breath, and then perhaps going deeper in, the beat of our heart as the blood courses round our bodies. If we went deeper into that listening still - we might hear the wood of a pew creek as someone shifts position, or the football match outside, or a plane going overhead, or of the weather outside or passing traffic. If we allowed our listening to go deeper still what else would we experience? As we listen intently we often close our eyes to focus in. When I was at Secondary school I had a music teacher who would do that - as he played is Grieg or Mozart he would close his eyes to focus in on the music and would drift away, carried on it’s currents to distant shores. and the deeper and longer we listen the more aware we become of everything else in it’s minute and infinite detail and the universe somehow becomes more alive with the sense that something else is here - that’s why many love to come into our churches and just sit in silence - they become powerfully aware of that gentle, unnamed and unknown ‘something else’. God. 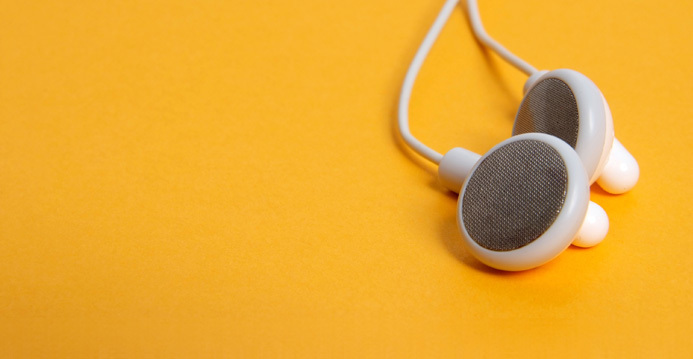 People, we, have been encouraged and invited to listen to Jesus before on many occasions, but now, as He turns literally and metaphorically, inevitably toward Jerusalem I wonder what intonation Jesus places on that one word in the middle of this morning’s Gospel reading: ‘listen.’ Is it an invitation to hear? It is a barked command? Is it pointed with frustration? But like a fox, set only on our own self preservation - the devious cunning of our hard Herod hearts breaks the heart of God. Listen says Jesus... but we are not. We are looking out only for ourselves, worrying about ourselves, concerned for our future alone, and in the midst of the anxious noise of our lives we’re making our own plans. we see and yet refuse to believe what our eyes tell us. We hear, but do not comprehend. Somehow, contrary to all that our senses reveal - we are loved beyond all imagining - and yet we do not, cannot, will not receive that simple truth - killing, stoning, ostracizing, excluding, silencing, degrading, humiliating and ultimately crucifying those who sing God’s love song, and it breaks the heart of the One who loves us. we are loved, we are loved, we are loved... beyond all imagining, more than we desire or deserve. Those words simply phrase the silent glow of the universe - all we see, all we know all we yearn for. So that’s Ash Wednesday done for another year, and by now you will have washed your Ash Cross from your forehead. Is it also entirely possible that the heart of what we said and heard and prayed and sung that day has also been wiped away from our lives and memories? The heart of the message of Ash Wednesday is to answer the church’s call to a Holy Lent. Not holiness in terms of otherness, of separateness, of distance from others within our communities, but actually actually the opposite - to see the forgiveness and mercy of God, spill out of our lives and transform our neighbourhoods and communities. Jesus struggles with a number of things in the wilderness - hunger and thirst but also questions of personal gain, how will the saving work of God through Him be worked out and, how should He use the power and authority that he wields most effectively? Most of all Jesus struggles with His own humanity as it is not just the nature of the temptations that Jesus faces that are important, it is the fact that He is tempted at all, for in so doing, Jesus identifies completely with us and demonstrates how challenging it will be for each of us to answer Ash Wednesday’s call. Jesus, full of the Holy Spirit is led out into the wilderness by the Spirit. He hasn’t uttered a word of teaching or performed any miracle and yet one so full of the things of God is confronted by the Devil. Whatever name you give him, and Scripture gives him many, there is a strong personal, cultural, and institutional opposition to the way of love, health, wholeness and peace that God proclaims again and again and especially through His Christ. As we struggle with ill-health, mental anguish, doubt or anxiety and supremely in an inability to love and be loved, we too grapple with this demonic power still alive and well in our world. Temptation is not a sign of weakness. Lead us not into temptation, or put another way - lead us not into the time of trial, we pray, not because we cannot handle it but because it’s not wrong to ask God to keep us from times of trial like that - no one wants to willingly endure it. Temptation is perhaps actually a sign of strength as we are not be tempted to to do things we are not able to do, but rather only that which is already within our power or within our grasp. And it is that that makes giving in to it so insidious, especially when our culture glories in gratifying our desires. Why should we resist temptation? It’s about knowing when we have enough. It’s about relying on God. It’s knowing our place within the grand scheme of things. Jesus is tempted to turn a stone into bread. We’re told that Jesus was famished in that wilderness time. We live in an age where food is a huge issue - millions have more than they need and many millions more have nowhere near what they require. Looking for food was not the purpose of Jesus’ wilderness experience - we need to to be conscious ourselves of when and how much we consume whether it’s food or other resources. Jesus was tempted to worship the Devil and receive the glory of the nations. We live in an age ever more concerned with the exercising of power - whether it’s human rights or the tabloid press hacking phones or bribing police. 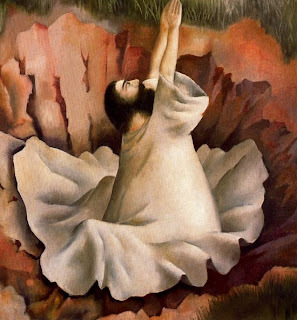 At His baptism and on the mount of Transfiguration we are reminded that Jesus is God’s Son on whom His favour rests, who is much loved by Him, who is worth listening to and who exercises the power and authority of God. Seeking power to control His own destiny was not part of Jesus wilderness experience - we need to be conscious ourselves of when and how we exercise authority over others whether directly or indirectly. Jesus was tempted to win Jerusalem and the world with a show of supernatural power. We live in an age where image is key and style rules over substance - where how you dress or where you shop or how you vote or even the colour of your skin or who you love labels you. Outward shows of spiritual might were not the purpose of Jesus wilderness experience - we need to be conscious ourselves of when and how we judge others or how we might be judged on outward appearances alone, rather than on the quality of love in action and how our lives cash up in enriching and resourcing others. Jesus resisted these temptations not because He was the Son of God, but because He knew the bigger story of God at work in the world as revealed to us in the Scriptures. Jesus quoting scripture at the Devil remind us of the power of that story which God has wooed humanity with over millennia - I love you, I want to be with you, will you be with Me which culminates in the triumph of Divine Love over the power of despair and evil. We cannot see these temptations outside of the context of the Devil ‘returning at an opportune time’ and testing Jesus not verbally but physically in His Crucifixion and Resurrection - the high point of that story - where those Devilish Powers at work in our world are ultimately defeated along with death itself. The wilderness time for Jesus was surely in part about Him beginning to discern His priorities, and ultimately concluding that to rely exclusively and utterly on the will and purposes of God was the only way to proceed. Even One so filled with the presence of God’s Holy Spirit had to make that choice and was not exempt from times of trial. As people filled with the Holy Spirit by virtue of our sharing in the Sacraments of Baptism and the Eucharist - we too will not be exempt from times of great testing and tria - but in those times and always - are we willing to be people of the Ash cross not just on Wednesday but on Thursday, Friday, Saturday indeed every day allowing the forgiveness we receive to shape our life but also that of our community, are we ready to open ourselves as Christ did to the will and purposes of God and rely exclusively on Him in and for all things, and are we ready allow His cross and resurrection to rewrite not just the future but the present part of the story God is writing in and through our lives? 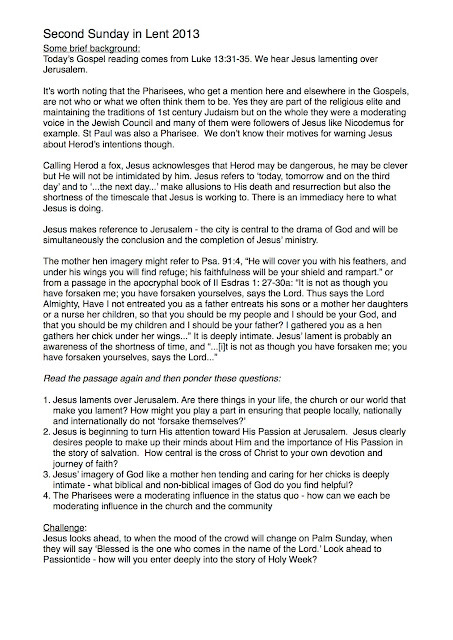 Here are some brief Bible study notes to be used in conjunction with Sunday's sermon based on Luke 4:1-13. Today’s Gospel reading comes from Luke 4:1-13. We hear this story, or versions of it in the other Gospels on this Sunday each year. We hear of Jesus spending time in the wilderness. It’s worth noting that this is the wilderness and not the desert. This is not a barren, lifeless wasteland, but the scrubland outside towns and cities. If Israel’s experience in exile in the wilderness following their freeing from slavery in Egypt is anything to go by, the desert, like mountaintops, is a place often where people go to withdraw and to encounter God for themselves. Jesus’ is led into this scrubland by the Holy Spirit. His 40 days there mirrors both Moses and Elijah’s time in similar places, but it’s most resonant echo is with the Israelites 40 years in exile led by God Himself to the Promised Land. Jesus, full of the Holy Spirit, is led there by the same Spirit is contrasted by Luke with the character of the Devil who tempts Him. Temptation lies at the heart of what it means to be human, whether to resist or give in to it - Jesus being tempted is Him identifying with us in every way. At the end of the passage we are told that the Devil departs from Jesus ‘until an opportune time.’ Jesus is tempted here with words, but the opportune time will come again for the Devil who will tempt Jesus with the actions of others as Jesus faces His Passion and Crucifixion. In both instances Jesus is victorious. 1. The temptations that Jesus encounters are personal (for food for his famished body), political (will Jesus submit to the ‘Ruler of this world’ namely the Devil for the good of the people of the world) and religious (will Jesus ‘win’ Jerusalem by showy miraculous power). We are tempted in many ways every minute, every hour, every day - do you find it easy to resist temptation? How do you succeed when you do? 2. Does contemporary society’s obsession with consumer choice and access to credit make giving in to certain sorts of temptation more likely? 3. Can you see how easy it is for our faith to become about feeding the hungry, the glory of justice for the nations or for showy acts of miraculous power - how does the church keep these temptations to turn Christianity into a one issue organization, in check? 4. Being tempted is not a sign of weakness but of strength - we are not tempted to do what we cannot, but what is in our power - can you relate to this statement? Christ resisted the Devil with words from the scriptures. Take one of the pieces of scripture that Jesus quotes from the Book of Deuteronomy and learn it this week. Archbishop Kalistos Ware tells a story of a peasant had formed a habit of slipping into a certain church at a certain time of day with clockwork regularity. There, day by day, he would sit and, apparently, do nothing. The parish priest observed this regular, silent visitor. One day, unable to contain his curiosity any longer, he asked the old man why he came to the church, alone, day in, day out. Why waste his time in this way? We aren’t good at sitting still and being quiet. We still tell our children sometimes that’s what we want them to do, but we really struggle to model it for them as we rush to the next event scheduled in our crammed diary, answering the email that is shouting for our attention, aware of pressing deadlines, ignoring our ringing mobile phone... If this is life for us, and for many people it is, it’s no wonder we grapple and grasp for God and long for deeper faith? Lent is time set aside by The Church to prepare for Easter, but often we read that as 40 days of Lent study groups, extra services, fasting, extra reading and reflection on the Scriptures and so on. All of that is good and worthwhile but it can transform this period of getting ready into a time of exhausting, frenetic activity. Let our Lent be different. This Lent, I would like every single one of us to give God at least 5 minutes of our time, to pray for ourselves, the church we usually attend and our shared life as a parish, to reflect on some scripture and to listen to Him. and through it, grew closer to you. On the back of the prayer card you’ll find some short verses of scripture. I encourage you to read them prayerfully. Through both, try to reflect on where God is leading us as individuals, as individual churches and as a Parish. Please do write down any thoughts or feelings that come to you - these could be specific like a project or a way to engage with the wide community. They could equally be something non specific like a desire for a deeper faith in God or a greater understanding of the scriptures or prayer. We will gather and share and reflect on these during the Easter season. This Lent, come and be still in God’s presence. Look at Him, He’ll look at you and in quietness tell each other of your love, for ‘...silence brings: peace amidst chatter, stillness amongst clatter, essence at the end of incessance and space for God’s eloquence...’ This Lent, may God give us all space for His eloquence. 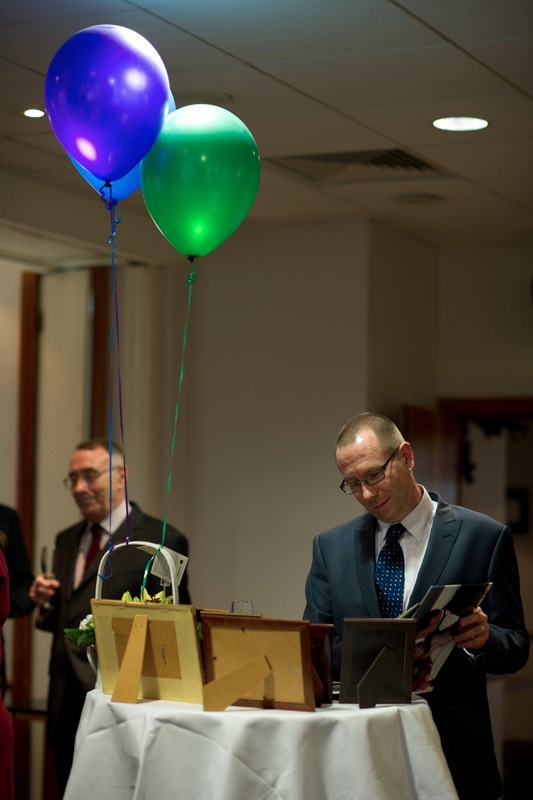 Me and my dad in the background - like father, like son! ‘Doesn’t he look like his father!’ or ‘Doesn’t she look like her mother!’ For some of us, if we’d had £1 every time we’d heard that we could probably retire early. It can be an inevitable fate for many children. It is said that when children are young, very often as babies look like their fathers - it’s nature’s way to establish paterntity. Today we hear God establishing His paternity of Jesus - and of all us. We preachers often think that this is an odd and difficult story and yet the oddness is not so odd at all. We’re told that Jesus’ garments shone as bright as lightning and that the appearance of His face changes. How it changes we’re not told. But the disciples experience something different in Jesus - Luke records them seeing His glory, His doxa, something of the majesty, stature and reputation of the creator of the universe is unveiled in those few moments. Something that gives Jesus something intangibly extra... it seems that maybe the true image of God, the image and likeness in which every single one of us is made, is comprehended somehow by them, the Son who is the spitting image of the Father. But then we miss seeing it too - in each other - each made in the same image of God as Jesus - as we hustle past people in the supermarket, as we are squashed by them on the train, as we find ourselves furious with them as they cut us up on the motorway, as we insult them, as we put them down or criticise them, as we mark them out as different because of their skin colour, their age, their gender or their sexuality... In those and countless other times we fail to see the image of our Father in their faces. The Glory is still there in the face of all... if only we don’t just sleep through it. Jesus’ glory, His true true nature is revealed by God, eight days after Peter has confessed Him as the Messiah and Jesus has spoken of His immanent Passion, but also following a time in the presence of God in prayer. There are perhaps here intended subtle references to the Resurrection of Jesus which took place the day after the Passover, the day on which the church traditionally gathers for worship - namely Sunday. As Luke records this event for us I believe he is making a point. The same Jesus who was transfigured on the mountaintop, is present amongst us as we worship. As Jesus connected intimately with His Father in prayer led to a physical transformation of His very being and a full revealing of His glory, as we worship Christ in this Eucharist - we given a glimpse of His glory in the Words of the Scriptures read, in the Sacraments shared and in each other utterly transformed by His Risen presence. As the disciples came down from the mountain they told no-one of the all-transforming experience of who Jesus really is which God had shared with them. All too often we are the same - after mountaintop experiences of meeting Christ in worship, we leave those encounters at the door and tell no-one. On the one hand that might be a comment on the nature of our worship sometimes. On the other though it says something about the unexpected nature of those encounters with God and where and when they happen. The same glory of God was at work in Christ on the streets and the lakeshore and the disciples didn’t fully see it and yet here on the mountaintop they do. How where and when here we perceive the glory of Christ is not something that we should expect, but a gift of God to give. This event though occurs following much teaching and ministry by Jesus in and amongst the ordinariness and brokenness of our lives. This mountaintop revealing serves as a hope and a validation - a validation of the ministry of Jesus, He is who He claims and what He has talked of, of His death and resurrection restoring the possibility of our relationship with each other and God, is worth hearing; and a hope that beyond the brokenness of our lives there is the promise glory - a restoration of who we are as people made in the image of God which is more than a ‘it will get better’ pat on the head, but a deep knowing in our inner being that one day all will be made new.